Raw vegetable and fruit juices for you? After watching “Forks over knives” and reading books about juicing, J and I are very convinced that we should change our diet by juicing and eating more vegetables and fruits. We bought a Hurom slow juicer (masticating juicer) in March 2013 and have been juicing since. Our little girl also has a small portion of juice every day to boost up her immunity. Fresh juices have so much nature goodness – vitamins, minerals, enzymes, phytochemicals and other essential nutrients – all packed in a cup. Our bodies are nourished almost immediately with these essential nutrients which processed juices can’t. As much as possible, we try to consume organic fresh juices. After we started juicing for a few weeks, my parents and siblings are also persuaded to join the juicing bandwagon and they have been juicing everyday too. My friends asked me why we started juicing – does our family have history of cancer or chronic diseases? Thankfully, none of my immediate family members have any chronic diseases. We juice to improve our health profile and to prevent possible diseases. Within two weeks of juicing, my sister’s skin condition gets better and there are lesser marks and itch on her arms and thighs. My skin also clears up after juicing. A personal friend of mine, after watching Fat Sick and Nearly Dead in early 2012, started to eat plant based diet and follow by juicing. She is healed of photo dermatitis that she had suffered for the past 25 years. My family’s general health improves with our daily juicing. We observe that my little girl is stronger now and even if she falls sick, she recovers very quickly. I am more alert and focus after I started juicing and plant based diet. Why juice when we can eat whole? 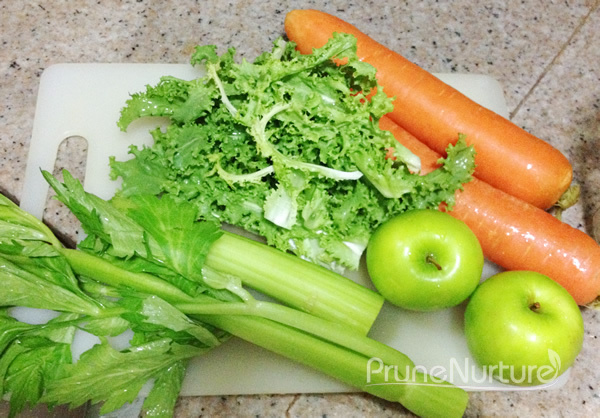 Juice drinking allows for better digestion and greater absorption. When we drink raw juices, these are digested and assimilated within 10-15 minutes after we drink them and are used almost entirely in the nourishment and regeneration of the cells and tissues, glands and organs of the body. That’s why it is best to consume juice first thing in the morning or 30 minutes before meals. It is recommended that we consume at least five servings of fresh vegetables and at least three servings of fruits daily. It is almost impossible to consume this quantity with our lifestyle and the fibre in these fresh produce fill us up so quickly making it even more difficult to meet the minimum servings so juicing is a good way to get our bodies nourish with all nutrients. Give our bodies optimal benefits by drinking fresh juices and eating whole vegetables and fruits. How much juice should we drink? Dr Norman Walker recommends at least a pint, which is about 500 ml, everyday in “Fresh vegetable and fruit juices”. Some juices like wheatgrass may not be suitable to consume at large quantity. Dr Norman Walker mentioned that fruit juices are the cleansers of the human system while vegetable juices are the builders and regenerators of the body. Do you know that vegetables are incredibly nutrient dense, even more than frutis? They have very high nutritional value with low calories and contain thousands of plant chemicals – phytochemicals. That’s why we need to consume more greens daily. I love my daily fresh juices. Some are refreshing and sweet, some are bitter and even spicy. As greens are more nutrient dense than fruits, we are adding more greens into the raw juices as we progress. A good example of green juice is Gerson green juice. Try to drink the juice as soon as possible, the best immediately. Green juices should not be stored for later use as they will oxidize quickly and lose their value. Is raw vegetable and fruit juices for you? Give it a try! Which brand & model did you buy? Hi Soo Guan, we use Hurom HU400. There are newer models in the market. You can do some comparison. Let me know if you need more info. Contact me direct.